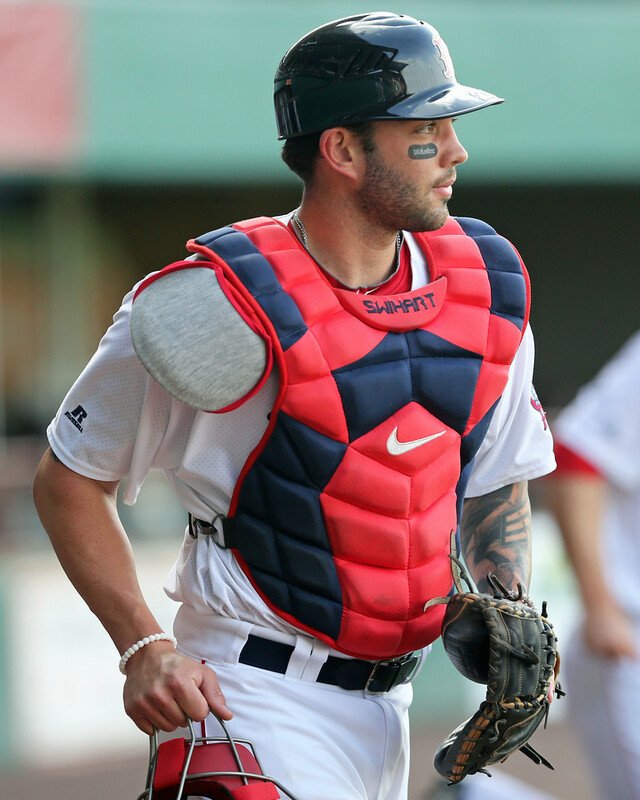 Blake Swihart (pictured) made his first professional start at first base on Monday in the Gulf Coast League. The ankle injury that ended Swihart's last season has impacted his ability to catch and the Red Sox are experimenting with other positions for the 25-year old. Swihart also played at first base on Tuesday but has gone 0 for 6 between the two games. Alex Speier authored an interesting read about infielder Tzu-Wei Lin's breakout at the plate this season. The 20th-ranked prospect is hitting only .234/.269/.299 since being optioned to Pawtucket but he had slashed .302/.379/.491 in Portland and .280/.379/.360 in Boston previously. An aggressive approach at the plate has potentially changed the career trajectory of Lin, who has profiled as a very light-hitting shortstop in the past and owns a .241/.313/.322 line in his minor league career. Hunter Noll of Outside Pitch has a spotlight on right-handed relief prospect Trevor Kelley. Kelly dominated in Salem this season with a 1.34 ERA and 32 strikeouts in 33 2/3 innings. Since a promotion to Portland he has a 4.60 ERA but he has improved and has only allowed one run in his last 6 2/3 frames. Right-hander Carson Smith, in Pawtucket on a rehab assignment, is feeling comfortable on the mound again. After being acquired from the Mariners in December 2015, Smith pitched in only three games last season before undergoing Tommy John Surgery. He threw a scoreless inning for the PawSox on Tuesday.